(1) There is no true multi-tasking. Your brain cannot actually do more than one task at a time. What we call multi-tasking is really just switching back and forth among multiple tasks. You’re still only doing one thing at a time, but you’re only doing it for a few seconds before switching to something else, and then switching back. 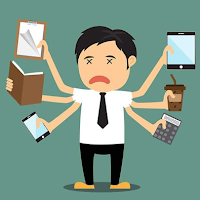 (3) The more we multi-task – that is, switch rapidly among tasks – the worse at it we become. Unlike just about everything else in life, multi-tasking is one thing that we get worse at the more we do it. In other words, the people who spend more of their time unitasking – focusing on one thing at a time and really getting into the zone in that activity – are better able to juggle multiple balls in the air when an occasion arises that they have to. The ability to see the multiple things as features of one thing – the present moment – helps filter out irrelevant information and keep the focus on what’s most needful about each thing. I mentioned the two aspects of mindfulness: (a) bringing attention to immediate experience – particularly, noting mental events as they happen; and (b) being open, curious, and accepting of whatever it is that you’re noticing. How do you do that? You can just decide to do that. Pay attention to bodily sensations, what thoughts are arising in your mind, investigate your immediate thoughts and feelings with nonjudgmental curiosity. Simply deciding to do that will typically last maybe 10 seconds. Maybe even a couple minutes. Then your usual habitual way of being kicks in. If you want to change your habits – become habitually more attentive to and openly curious about immediate experience, that’s going to take some work. Sorry about that. No easy walk to freedom. You could start with a class. 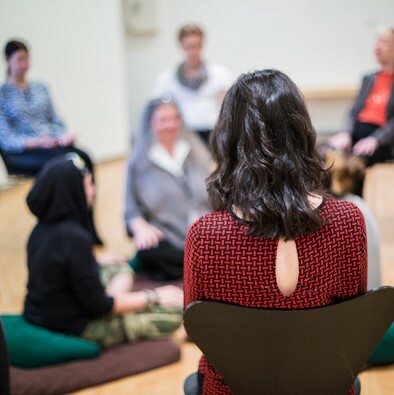 Google “mindfulness classes near me.” Prolonged reinforcement of the core concepts in a classroom setting will help shift your brain’s neural habits. Of course, you'll need to keep practicing after the class ends. One of the things the class will emphasize is a daily meditation practice – so if you just aren’t able to take 30 minutes out of your hectic day, then you probably aren’t going to get much more mindfulness than you already have. Another option is to skip the class and get a book. I’ve read a lot of books about mindfulness and meditation and Zen. 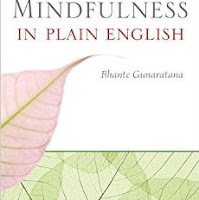 The very first one I read some 16 years ago is still the best first one – and if you only ever read one, this would be the one: Mindfulness in Plain English, by Henepola Gunaratana. (Available in its entirety as a free PDF HERE). If you’re ready to change your life, it’ll tell you how to do the practice that, if you stick with it, day after day, will be transformative. These are the truths behind the fad: (1) There's no easy path to transformation and liberation, and (2) There is a path that'll get you there if you stick with it. Strengthening the mindfulness muscle is kinda like strengthening any muscle – you make it stronger by exercising it. Kinda like, but also kinda unlike. With muscles, there’s a fairly predictable timeline by which exercise increases strength. If you have a normal and healthy physiology, and you adopt a regimen of exercise, and stick to it, then you will get stronger. There’s a rough curve by which, with some wobble in the graph, you will progress toward the limit to which that regimen can take you. Mindfulness strengthening doesn’t go like that. It’s not a reliable product of putting in the time doing the exercise. The spirit has its own schedule. Committed serious spiritual practitioners can go for years when their practice just seems void and useless. Then they can hit a patch where they actually seem to be regressing. 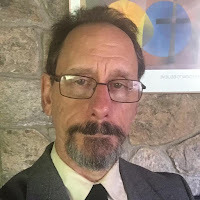 They’re acting as cranky, unkind, disconnected -- as withdrawn, on the one hand, or as controlling, on the other – as they ever had before they started any spiritual practice. There is no smooth curve of progress. But there do, overall in the long run, tend to be certain fruits of the practice. A related difference between the physical and spiritual is this: With physical exercise, you become different by becoming different. With mindfulness exercise, you become different by becoming exactly who you are. Slowly, one finds that the overlay of judgments about who you think you should be drop away, and your true self shines forth a bit more. It helps to have a group to practice with: a weekly group alongside the daily practice at home. Such groups aren’t hard to find. There’s one available here that I lead every Saturday at 10:00. Behind the fad, the third-eye chakra tea, the essential oils diffusers, the voice-activated guided meditation device, the acupressure meditation mats, the apps, the studios, the bells and whistles, there’s . . . you. And the reality you’re in and not separate from. And an authentic practice for being who you are and loving what is, every moment. Whether you go for the version with the monks and robes, temples and statues, and sangha community or the version with teachers in professorial casual at retreat centers or studios and no ongoing community to speak of, there’s something real there – something worth our . . . attention. This is part 3 of 3 of "The Mindfulness Fad"